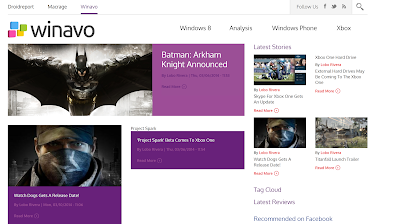 Winavo is a technology blog dedicated to the latest PC news, product launches and the intersection of all Microsoft platforms. We aim to provide the latest information about Windows 8 smartphones and tablets. We also cover the latest Xbox and Xbox Live news. An old Contact page lists four editors and reporters: Michael Nunez, Heriberto “Lobo” Rivera, Jordan Mammo, and Eric Chiu. For some reason, the same four names appear on the Contact page for NatureTimes.com, which was a bit confusing when I first stumbled onto it. Alas, dear friends, Bizu.tv is no more. Thank you to our viewers, content providers and advertisers over the last two years, it has been a great ride. Bizu.tv was featured in the 2014 IBT media kit, on a page describing video opportunities.